Syrupy, tart, with a depth of flavor from a pinot my mother loves, sweetened with some honey perhaps? I decided to pair it with some basil and mascarpone ice cream. I love using herbs in desserts and that bit of vibrancy freshened and brightened what is a decidedly rich indulgent dish. Making Ice cream in your Vitamix is easy. Simply freeze some of your liquid ingredients ahead of time in a few ice cubes trays. The general rule of thumb is ¼ cup liquid to 1 cup of frozen ingredients. I froze my ingredients and made the sauce the night before. This way I was ready to go the following day. I made the ice cream separately first—using the Dessert Program. Then I layered it in a bread pan and swirled the red wine strawberry sauce throughout. After a couple hours in the freezer it was ready to enjoy. A pale, earthy green and creamy confection laced with deeply hued ribbons of pinot noir strawberry sauce. I served each scoop with more wine sauce and waffle cone cookies. I can’t wait to share this recipe with my mom! Happy Mother’s Day to all the mothers out there or any magical woman in your life who supports and inspires you! This post was sponsored by Vitamix and The Feed Feed. All opinions, words, romantic feelings, and giddy enthusiasm are entirely my own. Make ahead: you’ll want this sauce to be cooled completely before mixing into ice cream. 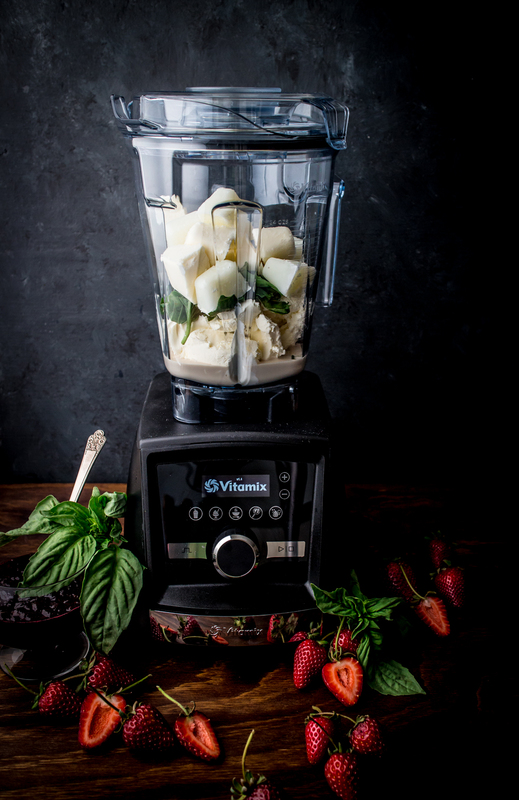 Combine all the ingredients in your Vitamix and pulse on variable 1 a couple times. This is for a textured sauce with small bits of strawberries throughout. You could also start on variable setting 1, slowly increasing to the highest setting, and blend for about 30 seconds for a completely smooth sauce. Pour strawberry wine mixture into a small saucepan and bring to a simmer over medium heat. Reduce heat and simmer for 20-30 minutes, stirring frequently, until mixture has reduced by about ¾ and easily coats the back of a spoon. Allow sauce to cool at room temperature before pouring into a lidded container and placing in the fridge until ready to use. Be sure to make frozen components ahead. Pour ½ cup milk and 1 cup heavy cream into two ice cube trays. You should have about 20 ice cubes overall. In your Vitamix add in remaining milk and cream, mascarpone, sugar, basil, salt, vanilla, and your milk and cream ice cubes. Select the Frozen Desserts program and you’ll have ice cream in seconds! Next, pour about half of your ice cream into a bread pan or other container. Spoon in about 1/3 cup of the strawberry sauce and use a butter knife to swirl into the ice cream. Be careful not to over do it! Too much swirling will mix everything into a murky mess! Pour in the rest of the ice cream, followed by another 1/3 cup of the sauce and swirl one last time. 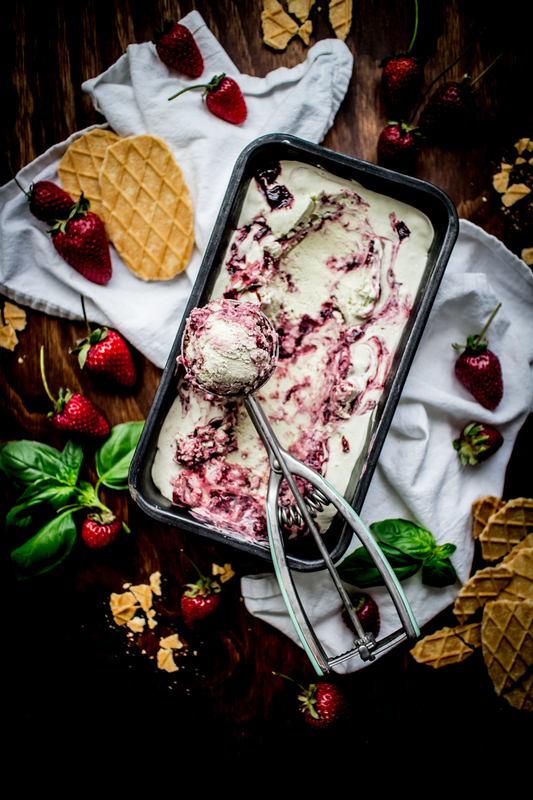 Carefully cover ice cream with wax paper or lid and place in the freezer for a few hours to set. Serve scoops of ice cream with any leftover sauce and waffle cone cookies. Note: I tend to go easier on sweeteners than most. I don’t enjoy overly sugary desserts! You may want to increase the honey in the sauce and taste as you go. For the ice cream you can add an additional ¼ cup sugar.